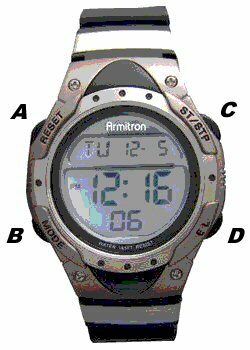 Purchased this Armitron Timepiece on June 12, 2010. The included instruction paper also called it an Armitron MD0346-R(T)-2. I learned from my call to them that this is the Model Number they want when you talk to them. Chronograph Mode: Minutes, Seconds and 1/100 of a Second with Lap Operation. Press 'D' (Light) in any mode to illuminate the watch face. The backlight will remain lit for 3 seconds. NOTE: Excessive use of the light will shorten batter life. And my little note. The Illumination feature on this watch is rather cool. The top portion shows in Orange and the bottom in Blue. Time Telling Mode displays Hours, Minutes, Seconds, Month, Date, and Day of the Week. From Time Telling Mode, press 'B' (Mode) once. Chronograph Mode appears. Press 'B' (Mode) five times to return to Time Telling Mode. From Time Telling Mode, press 'B' (Mode) twice. Countdown Timer Mode appears. Press 'B' (Mode) four times to return to Time Telling Mode. From Time Telling Mode, press 'B' (Mode) three times. Alarm Mode appears. Press 'B' (Mode) three times to return to Time Telling Mode. From Time Telling Mode, press 'B' (Mode) four times. Second Time Zone appears. Press 'B' (Mode) twice to return to Time Telling Mode. From Time Telling Mode, press 'B' (Mode) five times. Birthday Mode appears. Press 'B' (Mode) once to return to Time Telling Mode. flash. Press 'C' (St/Stp) to zero out the Seconds. Press 'B' (Mode). Hours flash. Press 'C' (St/Stp) to advance the Hour. Note: Pressing and holding 'C' will advance digits rapidly. and 'PM' indicates p.m. times. Press 'A' (Reset) to end sequence and return to Time Telling Mode. From Time Telling Mode, press 'C' (St/Stp) to enter 12/24 Hour Format. If the time of day is before noon, you will only see the AM indicator appear for 12 hour format and disappear for the 24 hour format. Course, after noon you will also see 12 added to the hourly number. From the Time Telling Mode, press 'B' (Mode) once to enter the Chronograph Mode. Press 'C' (St/Stp) to start timing. Press 'C' (St/Stp) again to stop timing. Press 'A' (Reset) to reset to zero. Press 'B' (Mode) five time to return to Time Telling Mode. While in the Chronograph Mode, press 'C' (St/Stp) to start timing. Press 'A' (Reset) to display the Split Time. Press 'A' (Reset) to clear the Split Time and continue time measurement. Repeat steps #2 and #3 to measure multi-Split Times. Press 'C' (St/Stp) to stop the Chronograph. Press 'A' (Reset) to reset the Chronograph to zero. From the Time Telling Mode, press 'B' (Mode) twice to enter the Timer Mode. Press 'C' (St/Stp) to increase the Hour, press and hold for quick change. Press 'B' (Mode) to select the Minutes. Press 'C' (St/Stp) to increase the Minute number. Repeat steps #4 and #5, the selection in the followinf sequence: Hour-Minutes-Seconds. Press 'A' (Reset) to exit the setting mode. While in the Timer Mode, press 'C' (St/Stp) to start the countdown. Press 'C' (St/Stp) again to pause the countdown. When the countdown reaches zero, the alarm will sound about 60 seconds. Press any button to stop the alarm. Press 'B' (Mode) four times to return to the Time Telling Mode. From the Time Telling Mode, press 'B' (Mode) three times to enter the Alarm Mode. Press 'C' to turn ON/OFF the Chime, press 'D' to select Alarms 1 to 5. While in Alarms 1 to 5, press 'C' (St/Stp) to turn ON/OFF the Alarm. Press 'C' (St/Stp) to increase the Hour, press and hold for a quick change. The alarm will sound at the preset Alarm time each day for about 60 seconds. Press any button to stop the alarm. Setting the operation of the Alarms 1 to 5 is the same. Press 'A' (Reset) to end the sequence. Press 'B' (Mode) three times to return to the Time Telling Mode. From the Time Telling Mode, press 'B' (Mode) four times to enter the Second Time Zone. Press 'C' (St/Stp) to change the Minutes, each press change 30 minutes...???? Press 'B' (Mode) twice to return to the Time Telling Mode. From the Time Telling Mode, press 'B' (Mode) five times to enter the Birthday Mode. Press 'C' (St/Stp) to ON/OFF the Birthday. Press 'C' (St/Stp) to increase the Month, press and hold for a quick change. Repeat steps #3 and #4 to complete the Birthday setting. Press 'D' (Light) to advance to the next Birthday. The Setting operation for Birthdays 1-8 is the same. The alarm will sound on the preset Birthday for about 60 seconds. Press any button to stop the alarm. Press 'B' (Mode) once to return to the Time Telling Mode. Change the battery when the watch becomes slow, the readout darkens or does not appear, or the backlight fails. Before removing the old battery, be sure to denote its polarity so that the new battery is installed in exactly the same way. Replace with one (1) CR2025 or equivalent only. This watch contains precise electronic components and should only be opened by a qualified watch technician. However, it is not necessary to return your watch to the manufacturer for battery replacement. It is recommended that you bring your timepiece to a local jeweler. Need clarification as to whether it is a CR2016 or CR2025??? This watch has apparently been out for a few years -but- finding info specific to it is a bear. Most of the info has 'other' model numbers on it. May be for this watch also but it is not stated so. Ok. I called Armitron and they said it is the CR2025. A battery powers a piece of quartz shaped like a tuning fork. An electrical charge from the battery causes the quartz to vibrate, creating a steady frequency used to count or measure time at an extremely accurate pace. This WebPage was created just for fun -and- cause I found Info on this watch hard to find. A number of people were already complaining about that. Then there are those that have lost the instructions (like I so oftern do ... they're small and tiny!!). Anyway, if you can benifit ... great. If not ... well Hello and thanks for stopping by.